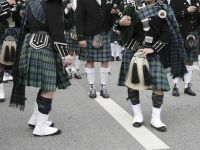 The New York City St. Patrick’s Parade is the oldest and largest St. Patrick’s Day Parade in the world. The first parade was held on March 17, 1762 — fourteen years before the signing of the Declaration of Independence. The parade is held annually at precisely 11:00 AM in honor of St. Patrick, the Patron Saint of Ireland and of the Archdiocese of New York. The parade route goes up Fifth Avenue beginning at East 44th Street and ending at East 79th Street. Approximately 150,000 people march in the parade which draws about 2 million spectators.